Blowout Sale! Save 62% on the Car Door LED Ghost Shadow Light for Mercedes-Benz ML(W166) E(W212) B180 B200 B260 A180 A200 A260 C Coupe(Two Door) Benz GL350,450,500,63 by Knragho at Defy Now. MPN: KN02WD. Hurry! Limited time offer. Offer valid only while supplies last. Clear Bright Laser LED Welcome Lights Door Logo Projection Emblem Light Kit for Mercedes Benz - Fashion Light & Shade Visual Experience for You ! View More In Emergency Light Fixtures. Clear Bright Laser LED Welcome Lights Door Logo Projection Emblem Light Kit for Mercedes Benz - Fashion Light & Shade Visual Experience for You ! Effortless Installation - No Rewiring, No Dissembling. No Damage to Your Car. PLEASE CONTACT US BEFORE ORDER IF YOU ARE NOT SURE THIS ITEM FIT FOR YOUR VEHICLE OR NOT! Note: All items Sold by "Knagho" and "Fulfilled by Amazon" with "Knagho" king box. Our products used exclusively high-quality rechargeable battery and secure PCB. We don't authorized any seller to sell it on Amazon. Please pay attention to it when "Add to Cart". If you suspected that you have bought FAKE items, Welcome to contact with knragho directly! Benz Logo led light will be brighter at night or at dark place, effect is not obvious at daytime. Light to open doors. Projection design can give others a warning to avoid an accident. when you open the door, the car logo will be projected on the ground. when the door is closed, the light will be off automatically. Welcome lamp is easy to install. No Rewiring, No Dissembling. 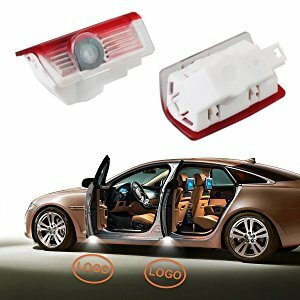 No Damage to Your Car, just replace your car door light. It can be installed in both left and right doors. Shadow Light will make your car look artistic. If you have any questions about this product by Knragho, contact us by completing and submitting the form below. If you are looking for a specif part number, please include it with your message.